The Samsung BD-C6900 is the beating heart of Samsung's 3D ecosystem. First unveiled at CES 2010, the Blu-ray player is a sleek-looking machine that's been given a slightly see-through chassis. You get a feeling that Samsung has made it transparent so that consumers can peer into the system and see the next-gen technology that is on-board. As you would expect from a Blu-ray player of this calibre, the C6900 has a number of innovative features. These include Profile 2.0 connect, Internet@TV connection, DLNA connectivity and 1GB of local storage. The 3D aspect of the Blu-ry player means it will be able to spin upcoming 3D Blu-ray movies. The first of which, Monsters Vs Aliens, will be bundled with the player. Annoyingly, however, active shutter glasses will not be included in the package which means you will have to use the ones bundled with the company's first 3D TV – the U7000 series - or whichever company's TV you decide to go with. This is no shock, considering that the company wants to create a home eco system for its 3D technology. But considering that only two pairs of specs will come with the TVs, you would hope for a few more when you purchase the C6900 as well. Other features on the player include ultra fast play mode, 7.1 channel audio output (analogue) and USB ports. Being that the C6900 is a 3D Blu-ray player, there HDMI port is HDMI 1.4. Price-wise, Samsung has not confirmed but it looks like the BD-C6900 will retail for £349. Couple this with some glasses at up to £100 a pop and the setup is getting a little pricey. Then again those early adopters who are going to get into 3D straight away will be used to paying a premium for new technology. 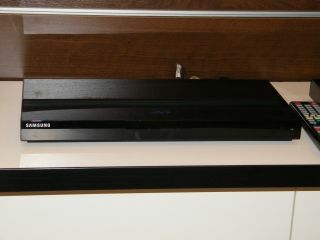 The Samsung BD-C6900 3D Blu-ray player has a UK release date of March.